The medium flow wrapped dressings are non adherent, but not hypoallergenic. We do offer low allergy dressings, which can be found under product codes 57018, 26394 & 84138. Every wound will receive adequate protection with the addition of our Medium Dressings to your First Aid Kid. 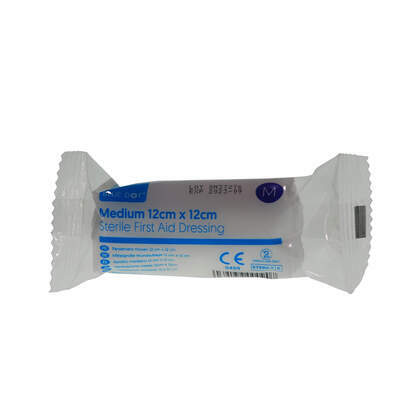 These individually wrapped dressings feature a non adherent pad that can be gently placed on top of the injury without sticking to open wounds. The extra long, fast edges conforming bandage wraps comfortably around any body part while contouring to ensure the tightest fit. Each bandage is wrapped in such as a way to ensure the pad does not need to come into contact with the applier, keeping it sterile throughout. Take a browse through the rest of our Wound Dressing products including our Large Dressings or even the most specialist, Eye Pad Dressing Sterile.